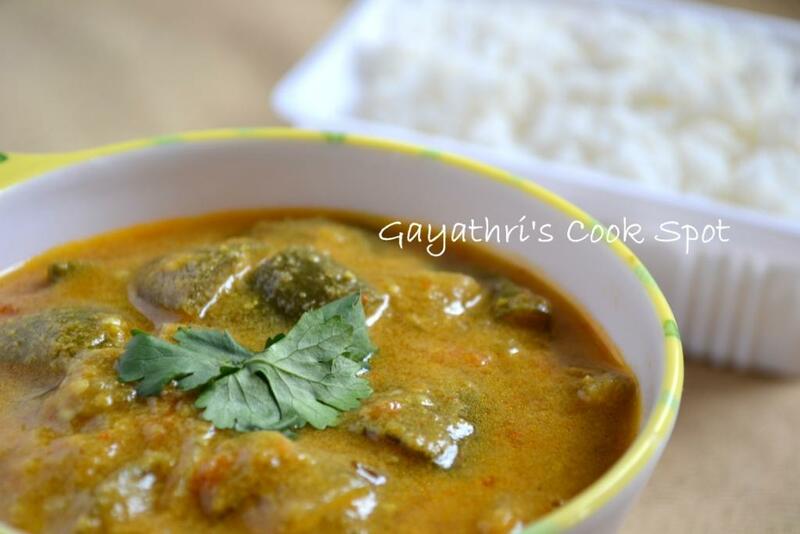 This is another chettinad dish using eggplant. The original recipe includes a potato which I skipped because I didn’t have it in my pantry at that time. This goes well with rice. I prepared it for the lunch and we liked it so much. But in the recipe the chef has mentioned that this is prepared as an accompaniment for chapathis and parathas. But we didn’t like it that way. But with rice the therakkal was fabulous. 1. Grind coconut, cumin, 1/2tsp fennel, cashew, roasted gram, green chillies and red chillies to a fine paste. 2. Heat oil and add 1/4tsp fennel, cinnamon and black pepper. When they splutter, add the onions and saute till golden. 3. Add the cubed eggplant and tomatoes. 4. Saute till tomatoes become mushy. 5. Add the paste and salt. Add enough water to make a gravy and bring it to boil. 6. Switch flame to low and cook until the raw smell is gone. 7. Transfer to a serving bowl and serve hot. It looks so authentic…like to have with rice and roti..
Looks absolutely inviting and flavourful,fingerlicking gravy definitely. The gravy looks real thick. The name is new to me..looks yummm!